Sugar & Spice Layer Cake — always with butter. Donut peaches are so much cuter than normal peaches. First of all the name just makes them better. Secondly they kinda look like alien fruit, a flat fruit? its strange. Lastly, they cut into such nice small slices. Don't get me wrong, use a normal peach for this recipe and its no problem. I love them just as much as anyone else, but the weird little donut peach just have a special place in my heart. This is one of the first cakes I have made that didn't have frosting on the sides. Figures that the minutes I buy a proper rotating cake stand, I make a cake where I don't need to use it. 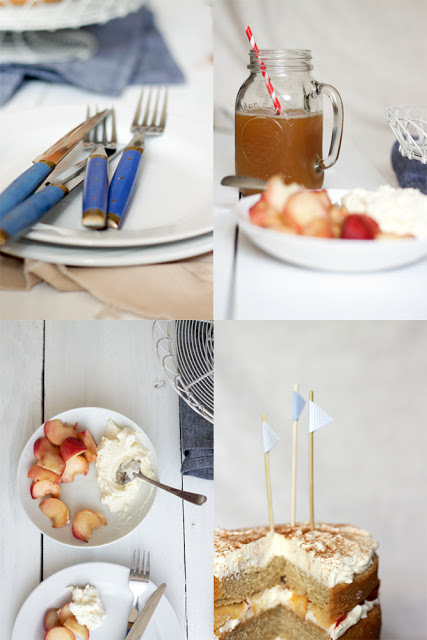 But this cake is perfect for summer. It is not heavy, not very sweet at all and versatile because the peaches can be swapped out for pretty much any other fruit. The 'frosting' on the cake, well if you want to call it that is such a change from what I am used to. Frosting to me is normally super sweet and thick as heck. This mascarpone/whip cream hybrid is a lovely light topping that doesn't take away the spotlight from the peaches. There was a bit of 'frosting' left over so I just served it with the extra peaches. And maybe just by itself... Hey, its not like I was eating a bowl full of buttercream, right? This 'frosting' is the kind where you don't feel so guilty about just eating it on it's own. I think I use a different recipe format for everyone post lately. I just my utensil garland recipe cards for a while but I just get too bored with doing the same thing for every post. Its so much of the fun to hunt for new fonts that fit the recipe, figure out how to do the layout so that it is pretty but still easily readable and to challenge myself to come up with something new to surprise you guys. I sometimes think that I put a lot of effort into something that I don't get paid to do at all, but all your comments or nice emails make it worth it most of the time. I love to hear people's responses to what I do, because I generally get stuck in that self deprecating, I hate everything I do mode. I'm not fishing for compliments, I liked it most in school when people wouldn't say "Oh I love that" but "I think doing 'so and so' would make it so much better." Oven 350F. Butter and flour two 6x3 cake pans for two standard 8inch pans. Sift flours, baking powder, cinnamon, nutmeg and salt. In a separate bowl, cream butter and sugar for 3 minutes until pale and fluffy. Add eggs one at a time then vanilla. Alternating, add in flour mix and milk. Beat for 1 additional minute. Divide evenly between pans. Bake for 30-40 minutes until center is set. Remove from pans and let cool completely. Whip heavy cream in a stand mixer until till stiff peaks. In a separate bowl, whisk mascarpone with sugar until smooth. Fold into cream. 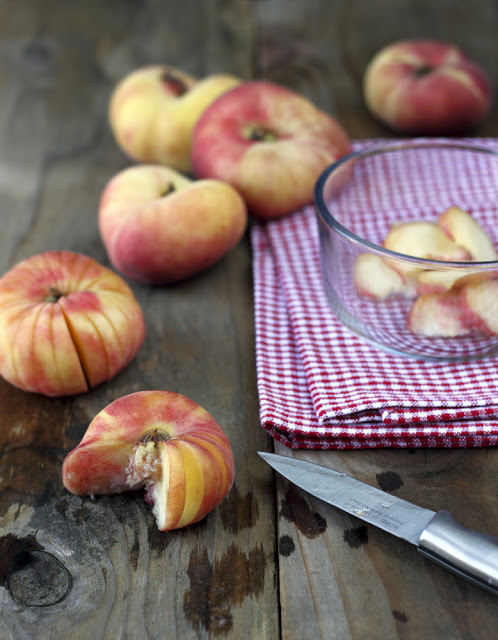 Cut peaches into thin slices. Cut both cakes in half so you now have four layers. 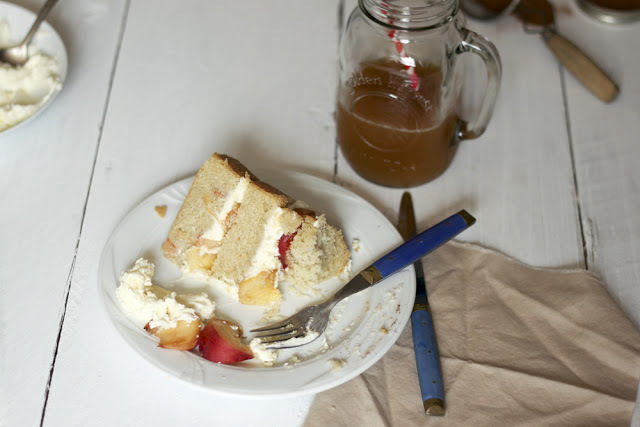 Layer cake, frosting and peaches. Repeat until all layers are used. Only put peaches on middle layers, only frosting on the very top layer. Dust top with cinnamon.